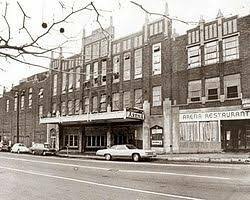 In 1967, I was attending a small, Catholic women’s college in New England. The first semester was winding down and everyone was tired and stressed, trying to finish papers and prepare for exams. 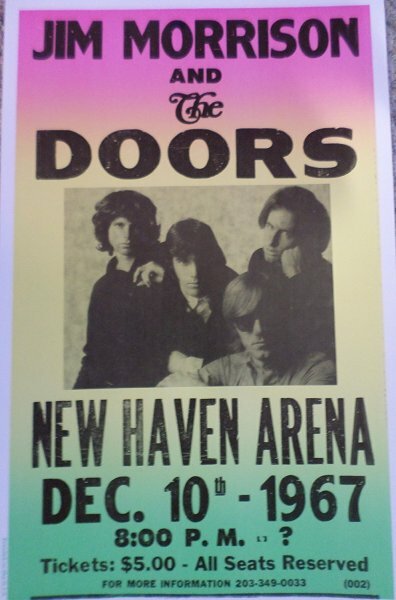 Miraculously, the rock and roll gods smiled on us and we learned that the Doors would be performing at the New Haven Arena on December 9. New Haven Arena was a relatively small venue seating 4,000, so we were assured that we would be close to the action. The Doors were still new to the music scene, having released their first album in January of that year. Back then, it took a while for music to reach New England from the West Coast. I don’t think any of my friends had heard of the Doors, but, at my urging, several agreed to make the trip to see these rising stars. By the time we were seated, all of us were excited about the show. The first opening band did their set and then Tommy and the Rivieras took the stage. The Rivieras, a local band, frequently opened for acts at the Arena. 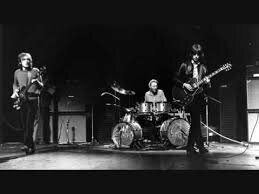 They were quite good, but on this night their set seemed unusually long. Delays were not uncommon at rock and roll shows. We accepted the delay as just one more result of artistic egos, drugs, or alcohol. Nevertheless, the Rivieras started to look a little uncomfortable as they continued to play. Finally, the Doors were on. It didn’t take long for me to become mesmerized. There was Jim Morrison in the sole spotlight, dressed in black, with long wavy hair, caressing the microphone and singing with an intensity I had not seen before. I knew we were seeing a new rock icon. Not long into the set, Morrison began an impromptu tirade about the New Haven police, complete with profanity we hadn’t heard before from a performer. 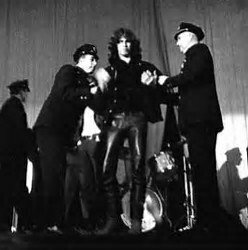 The lights went up, the police came onto the stage, Morrison was handcuffed and lead away. This was the first, and last, time a performer had been arrested on stage during a performance. The audience was in shock. I was hoping this arrest was part of the act. Emotions changed from shock to confusion to anger as we learned the show had been shut down. Fearing a riot, my friends and I managed to get out and drove home tired and angry. We later learned what had happened before the show. In the backstage area of the arena, all the dressing rooms and bathrooms were connected. That evening, there was an unusually large number of people milling around and the police had been called to clear people out. Tommy Janette from the Rivieras found a couple making out in their shower. Fearing for the security of the band’s personal items, he summoned the police. No one recognized Jim Morrison as the intruder. The police arrived and told the couple to move along. Morrison replied, “Eat me.” The police got out their mace and told Morrison that this was his last chance. Morrison shoved the officer and replied “This is your last chance to eat me.” He and the girl were maced and pandemonium erupted. The Doors‘ manager arrived and explained whom they were dealing with. The police agreed to allow the Doors to perform and told Morrison to behave. While recovering from the mace, Morrison demanded that the mayor come and apologize along with other unmet demands. After close to an hour, the Doors were ready to perform. 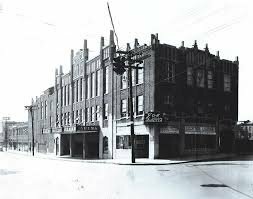 Contrary to popular belief, there was no “blood in the streets,” although New Haven was mentioned in the 1970 recording of “Peace Frog.” The only other arrests were a few journalists who interfered with police. Some fans went to the police station, but none was lucky enough to be thrown in jail with Jim Morrison who was charged with inciting a riot. His bond was $7,500 which he extracted from his wallet and paid. In retaliation for his poor behavior, New Haven radio stations refused to play “Love Me Two Times,” saying it was too suggestive. In 1971, Jim Morrison became another star to fall victim to heroin. And to my old friends who were “dragged” to New Haven to see some “creepy” guy get arrested, I say “You’re welcome.” We were there when rock and roll history was made.